We Need Your Help In Funding the 2019 Celebration Series. We need your help in funding our celebration set for 7+ events in the 2019 series. If we can reach our annual goal, we will be able to help our local Veterans of Foreign Wars and Disabled American Veterans, and help with our donations to fight cancer locally. We hope that you will become a donor or co-sponsor. 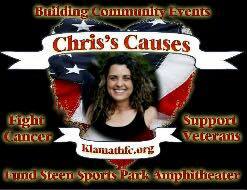 What is the Klamath Freedom Celebration? The Celebration Series as always is set to honor all active and non-active Military, Police, and Firefighters who have served this great country, and their families, as well as the community who share the sacrifice with them. We have also joined the Battle Against Cancer in remembrance of our co-founder Christina Brown, who passed from breast cancer on March 3rd, 2016. She was our heartbeat and we will continue our mission in her name and legacy with proceeds from our events going to the Sky Lakes Cancer Center. If you would like to become a sponsor, we are planning an advertising campaign, including RV, radio, programs, brochures, social media, webpage, and posters which can give your business extensive exposure. If you do donate, you will have the satisfaction of supporting veterans and cancer victims locally. Your support will allow us to offer our community a series of entertainment, education, celebration, collaboration and learning opportunities at minimal cost and which could result in positive changes in our community for years to come. Our detailed sponsorship breakdown is shown below. Join us by sponsoring or donating to this great event. We look forward to your reply ASAP for the 2018 Klamath Falls Freedom Celebration Series! Your contributions are tax-deductible through our Klamath Freedom Foundation. If you are interested in being a Presenting Sponsor of one of our events, please contact us and ask for that information.